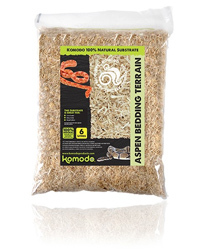 Aspen Bedding is the professionals' choice for many species of reptile including Corn Snakes, Kingsnakes, Milk Snakes, Sand Boas and other burrowing species, Blue Tongues Skinks and many Monitor Lizards. It may not be suitable for Rainforest species. Cover the floor of the vivarium with Aspen Bedding Terrain, usually at least twice the depth of the animal's body. Spot clean daily, replacing soiled material with fresh Aspen. Change all bedding monthly or as required.